Anyway, today I have some super fun things to share with you. Jewelry!!! Everyone who loves jewelry raise your hand. Everyone did? Okay, good! 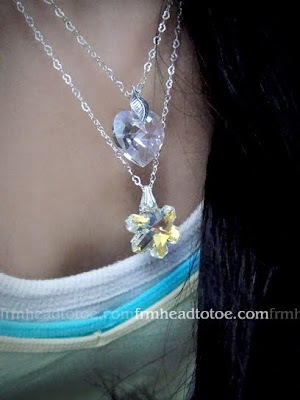 I think one of the easiest ways to spice up a simple look is to add some nice bling like a sparkly necklace. It's SO simple but it does make a big difference. I recently got these DSK Jewelry necklaces from her K-Drama series and they are perfect for matching with everyday clothes. Here's me being a thug with the Autumn Story necklace. It's just SO CUTE. 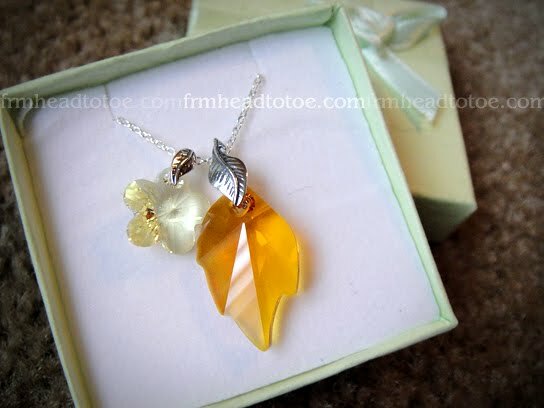 I think it has more charm than most necklaces, don't you think? You can really see the color and sparkle here. I don't own any other necklaces this color, and it looks so nice as a pop of Fall color! This is my thug button. 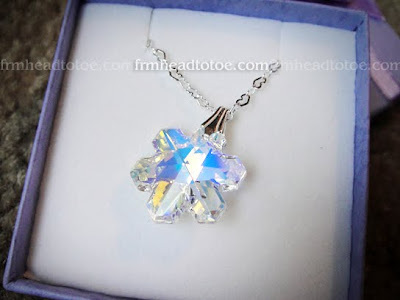 And here is my gorgeous snowflake necklace on an 18" chain. This crystal is foiled in the back so it REALLY SPARKLES! Wearing it with my Moonlight Heart necklace. The Snowflake reflects blue and gold while the Moonlight reflects blue-purple. And here is my eye look for the day. I used the Ben Nye Palette with the green, blue, and yellow colors. Lashes were from Sugar Cosmetics, really nice and natural-looking! Okay, that's all I have for you guys today. If you want, you can head on over to vote in The Body Shop's vlogger holiday look competition for one final day. Voting ends tomorrow and, well, I hadn't even considered the possibility of winning. I never want to jump the gun and try to hope for the best and expect the worst but I have been so blown away in shock and awe at the support that I've received through my first competition so far. I still can't even believe it. Not to say that I will win, but if that possibility occurs, I don't even know what I'd do with myself. Cry, probably. We'll see what the final results are in a couple days! Are you guys in Thanksgiving thankful mode yet? I am!!! Love you all! Thank you! 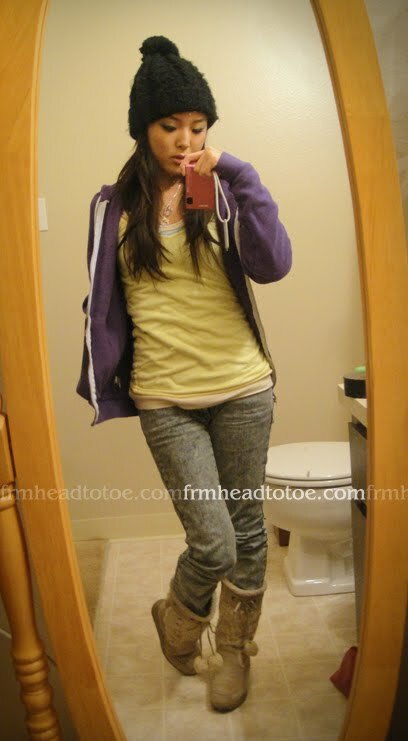 That is a super cute outfit! The yellow and purple look good together. oooh, i love this fotd!! love your new layout! and those necklaces are so beautiful!!! been looking for some natural looking false eyelashes for awhile now, so was wondering which type/style of the sugar cosmetic falsies are you wearing? thanks muchos! Ahhh, DSK Necklaces. <3 I absolutely adore Steph's work. She's so good at what she does. Your beanie is so freaking adorable. I love iiittt. This is definitely the perfect time for beanies too. ;D Your outfit is cute as well. You look so pretty! I've been voting for you, and hope for the best!! Thanks for sharing! p.s. I keep showing everyone your kiss acrylic nail post, lol cause those nails are so damn cool! 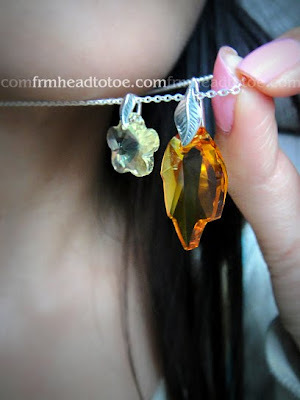 Posted a lil shout out to frmheadtotoe.com on the jewelry blog! Have a great night Jen! Love ur look and the necklaces! Hi! You got a vote from me! 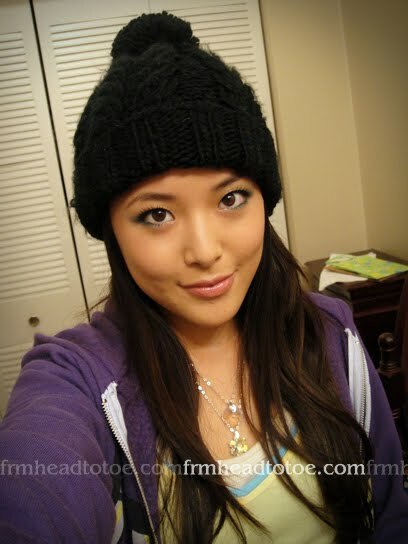 :D Love the DSK necklaces and your cute beanie. Ooohh! I love the makeup! Poo. Wish I've known about DSK sooner. That autumn necklace is just perfect in every way. My friend's also a big fan of that drama. How much did you get for both? I just saw the same snowflake at Kohls for 17 bucks. Love all your looks. You look really nice!! you look pretty! and the necklaces are cute too! DSK is too expensive =( I like He Qi better. Love your eye makeup here. Is it possible for you to do a quick tutorial on it??? Pretty please??? You know you can make those necklaces yourself for less than $5 instead of spending $40 on that dsk website?